Where Hot Foot leads, others follow. Hot Foot Repellent Gel with our unique chemical formula is totally different from other tactile repellents. In fact it is so different it originally carried a worldwide patent. Hot Foot works through its sticky nature and NOT by burning or irritation, making it a more humane - and greener - solution. With the correct bead depth and application pattern, Hot Foot Repellent Gel can last more than two years between applications. Download our Hot Foot Repellent Gel Guarantee. 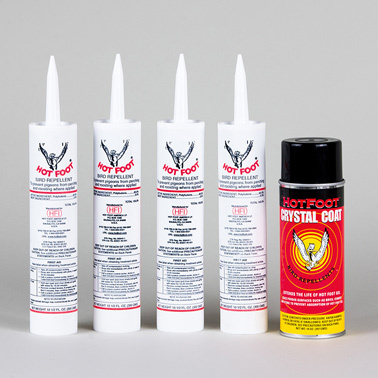 Hot Foot also supplies a spray coating with every gel purchase. When applied this forms a dry, brittle barrier on top of the sticky repellent. This coating protects birds from entanglement and also places a barrier between the gel and the environment. Dust and dirt and other pollutants cannot stick to the gel, extending the economic life of the product for up to 10 years. If you treat only one portion of a roosting surface, or only a few of all the roosting surfaces, then pigeons in particular will make repeated attempts to regain entry. Within 3-6 months, birds will have established an entry "corridor" into the application and a repeat application will be necessary. In partial applications, Deter Spikes should be used to surround the gel application so the birds have to over-fly them in order to gain entry. Consider aesthetics. Over time the tracks of gel will darken as dust and dirt accumulate. If this visibility is a problem then use Hot Foot Springwire or Deter. Application is a lot faster when using the Hot Foot Battery Powered Caulking Gun or the Ezi-Flow Gun. With clear access to the application surface requiring no access equipment one person can apply 120ft. of Hot Foot Gel per hour using the Battery Gun. When not using this gun and working off a ladder only 40 ft. per hour may be achieved.